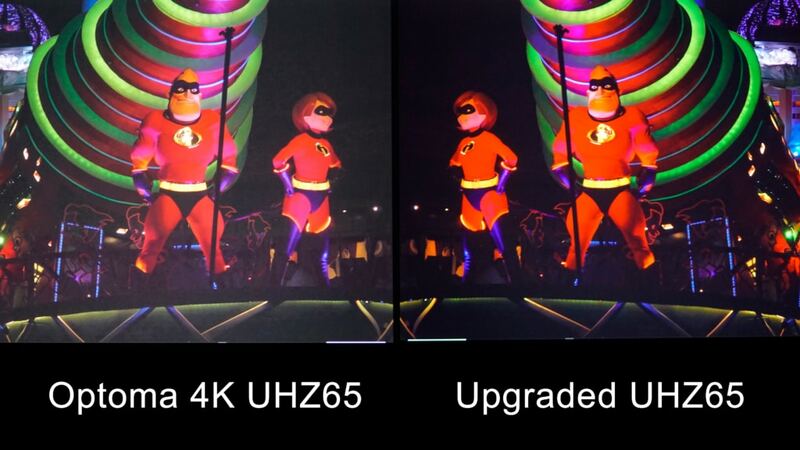 The Upgraded UHZ651 is a modification and re-calibration of the Optoma UHZ65 laser 4K UHD projector. 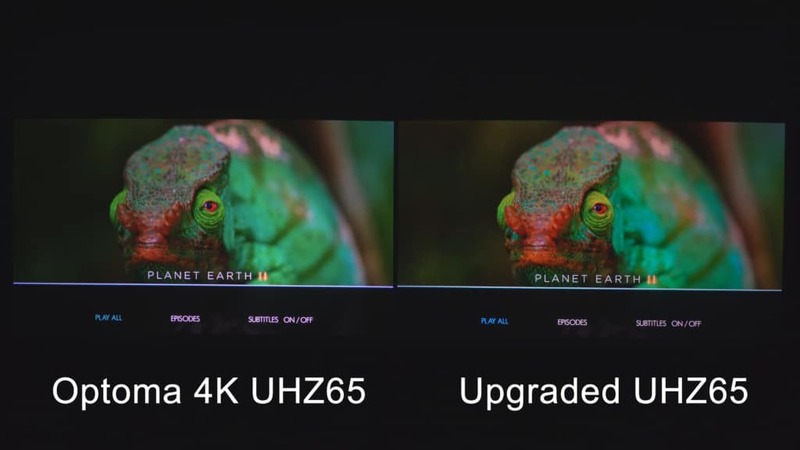 The changes are designed to increase the color gamut to achieve over 80% of the wide color gamut for the HDR standard, known as REC 2020, and to improve the black levels and contrast of the projector. 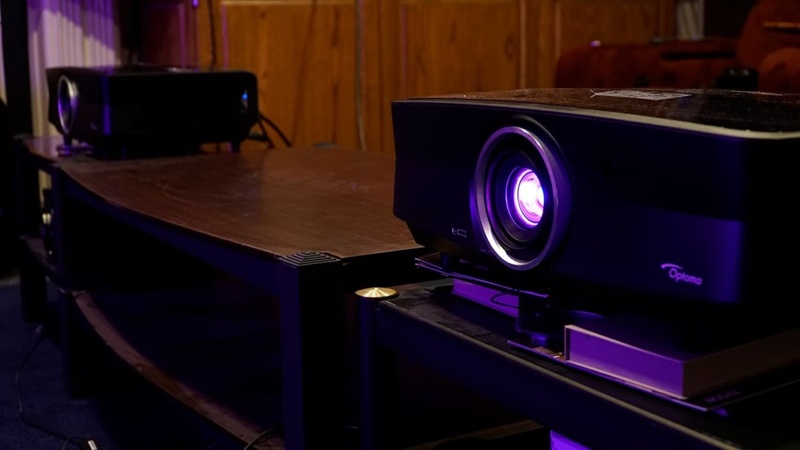 The motivation for this upgrade was prompted by the fact that currently on the market most laser based 4K projectors are currently over $10K, and those which can achieve close to 80% of REC 2020 are currently over $35K. I personally love the rich color and deep reds of a wide color gamut like some high-end flat panel TVs, but had seen nothing in the market for a 4K projector at a reasonable cost. 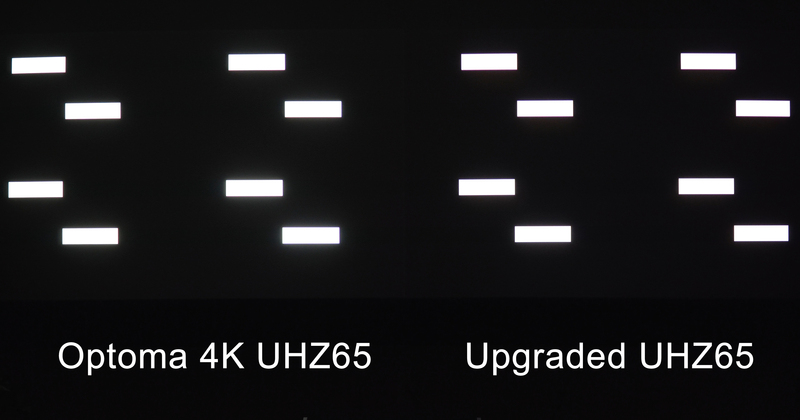 When we first looked at the UHZ65 over a year ago, we were pleasantly surprised by the performance and immediately started to compare it to other 4K, and 4K shift, or “Enhanced 4K,” projectors. What we found was not only could it hold its own with some of the best available, but it was laser, and we understand laser projectors and had been selling professional laser projectors for almost three years. In our opinion, laser light source in a projector is a very big deal and has changed the landscape in the professional, government, and higher education markets for good. Laser light not only eliminates bulb replacements, but it holds its brightness much much longer. Even at 20,000 hours it is only one half its original brightness. That means in terms of color stability and color fidelity a laser projector will hold its calibration much longer, and does not drastically change in the first couple of hundred hours like a lamp-based projector. Once we saw the images from the UHZ65, which at the time was almost half the cost of its nearest competition, we were hooked. The UHZ65 had become a benchmark in the cost-effective 4K HDR-capable projector arena. We just wished it had a more extended color range and slightly better blacks in low level scenes, hence we spent the next 11 months working with some of the best optical engineers in the country to develop this upgraded1 version. 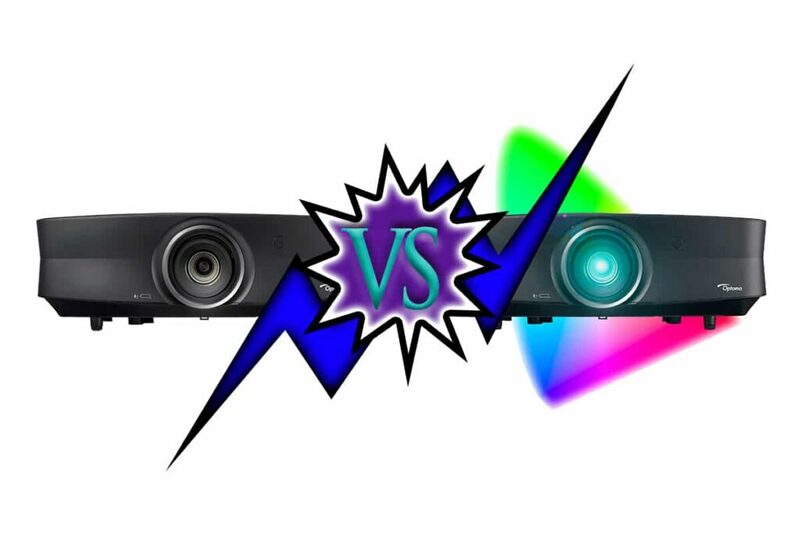 It is also worth mentioning that both of these projectors do have their limitations and we would not, and do not, recommend either of these projectors to serious online competitive gamers or to those 3D-enthusiasts who enjoy and want to continue to use their 3D Blu-ray discs. These projectors are for those who appreciate and enjoy high quality projected images in 4K HDR and HD sources at a reasonable cost that will last for many years without the expense of lamp changes and continued calibration adjustments. Both projectors were set up side by side to compare on the Stewart StudioTek 133″ reference screen. One of the things that we really liked about the UHZ65 is the bright output of the laser light source. While most 4K home theater projectors have been in the 1,300 to 1,900 lumen range, the UHZ65 is able to output a 3,000 lumen usable image. By usable we mean the color balance is still reasonable when compared to many lamp-based projectors which, when put in their brightest modes, are yellow-green and, for most people, unwatchable. Most home screens will never need 3,000 lumens. However, when using HDR sources and better color modes than the “Bright” modes, the extra light output is much appreciated. It is also known science that to improve contrast and color it reduces the light output. By starting with so much light capability, the improvements to both color and contrast in the upgraded version1 would still result in a very usable projector for a screen up to about 140″. 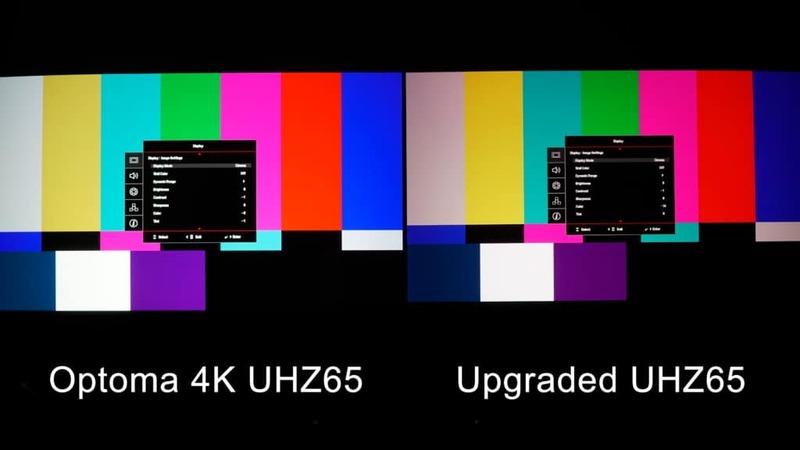 The Optoma 4K UHZ65 will be on the left and the Upgraded UHZ65 will be on the right. Although some differences will be visible in the color, most of the differences will not be visible due to the limited color gamut of most displays you will see this on. However, the color gamut charts which will follow will show the differences. 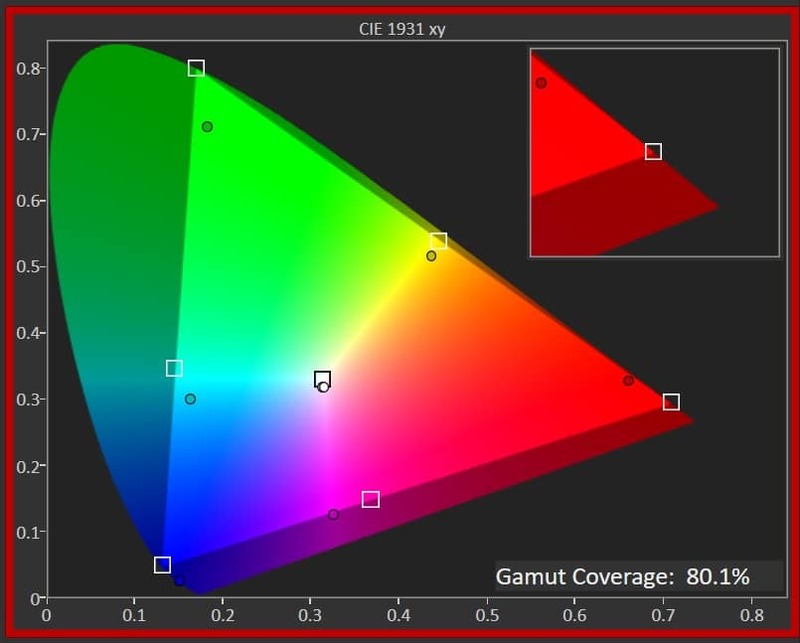 In order to show the real differences in color gamut (since very few wide color gamut monitors with 80% of REC 2020 are available currently), we decided to show the actual color gamuts as captured and displayed on the calibration software. UHZ65 color gamut measured in the “Cinema” mode which is also used in the HDR mode. 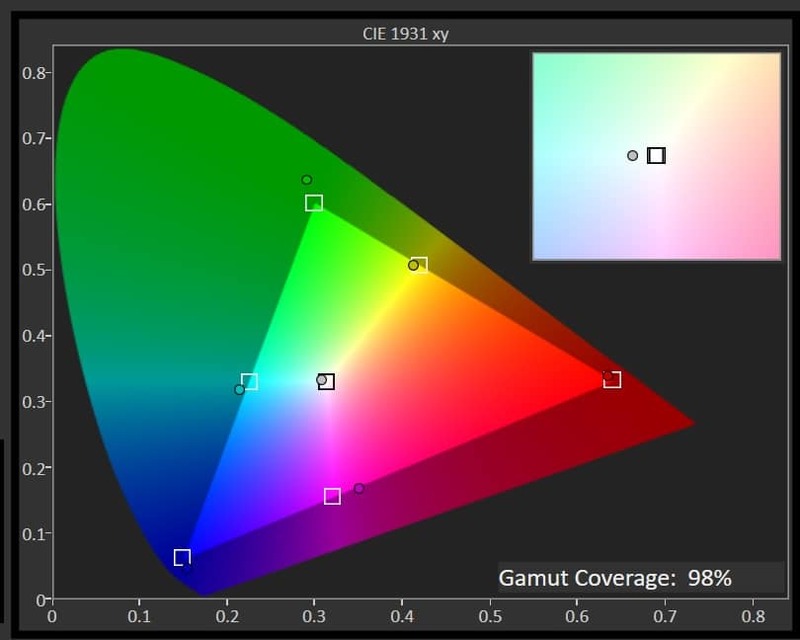 Notice the excellent green capability and good REC 709 coverage without any modifications.The lighter triangle represents the REC 709 reference color gamut. This is the Upgraded UHZ65 in the “Cinema” mode which we re-calibrate after the optical modifications to DCI P3 which, as you can see in this case is about 142% of the REC 709 color gamut. 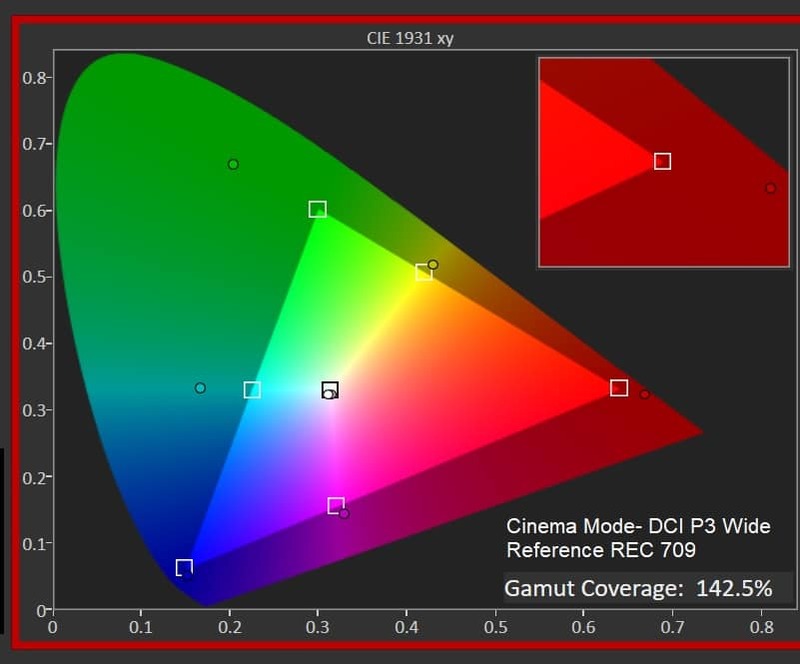 Notice: the deeper reds and extended greens and cyan that DCI-P3 gamut adds to the REC 709 standard. Here, the full REC 2020 triangle is displayed to show the upgraded HDR wide color gamut. This level of color difference is very visible on most 4K HDR Blu-ray discs. Depending on the color gamut of the display you view this on you may be able to see some of the differences between the normal UHZ65 on and the upgraded UHZ65. Both are very good on this excellent 4K HDR disc of Planet Earth II but there are colors that you can see in person on the Upgraded UHZ65 that are simply not present in the normal version. The real test of expanded wide color gamut is the final viewing experience on a good 4K HDR disc on a display which is capable of displaying the wider color. Even though most displays you may view this comparison on are probably not capable of the additional color, some of it does seem to come through even though it is not as dramatic as seeing it in person. This is the opening scene for Guardians of the Galaxy Vol. II. The wide color of the creature’s gases that he exhales is very dramatic and exciting. Even though there is a considerable difference in actual measured lumens on the screen, as can be seen in this side-by-side simultaneous image, the purity and boldness of the color seems to trick the eye into thinking it is as bright or brighter than the image on the left, This is know as the Helmholtz Kohlrausch effect. There is an effort underway to come up with a new measurement of lumens for projectors with high color purity and wide color gamut. We are not aware of any current standards, but due to the above effect, we may see some in the future. If you look carefully at the image of the color bars at the beginning of this blog and look carefully at the very first 75% white bar on the left of each image you will see that, indeed, the unmodified UHZ65 is brighter even though in many of these images it is hard to see – both in person and in these images that are captured. In this test color slide on both projectors, differences in color can be seen even on some REC709 color monitors, as deep reds, like on the right, are just outside of REC 709. A good P3 capable monitor will show even more differences. We found it very interesting that images from high resolution stills, like the one above and the ones which follow, seem to show even more differences than some 4K HDR movies did. We think that may be due to the fact that many 4K HDR movies are color graded to the P3 standard within the REC 2020 color gamut. Most photos are not limited to just P3 and can take advantage of the full REC 2020 color space. As more 4K HDR displays with color gamuts wider than P3 become more common, we hope to see more 4K HDR movies graded to the full REC 2020 color space, as the ACES post production workflow and others can, and do, support the full REC 2020 specification for wide color gamut. This photo was shot at the Disney “Paint the Night” parade, and almost all the lighting was pure LED – very vivid and wide color which was spectacular and even seems to comes through on some good REC 709 monitors to some extent. In this slightly over-exposed image (to better see the differences), the improved black levels can be seen both inside and outside ( above and below) the white frame lines from the 4K test signal generator. Notice that unlike an iris-based projector, the white frame lines are almost the same brightness as the unmodified projector. Good native contrast is a characteristic of DLP-based projectors. Even though many do not live up to their full potential, Optoma has done a good job in this design. In our “Semi Black” test we are able to evaluate the actual black level in a scene without the effects of an iris or light dimming. This is because once a scene has enough highlights (think of HDR) as brightness found in this test signal, most projector designs will not try and use their iris or light control as it will reduce the contrast and brightness of the highlights. 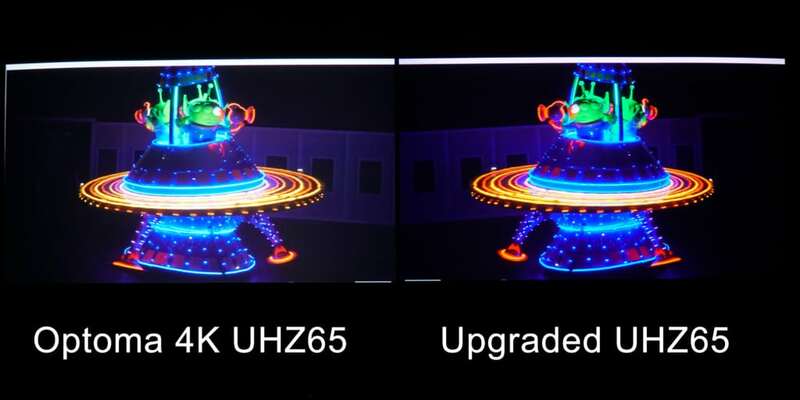 Here our improved black levels of the Upgraded UHZ651 translate to good dynamic range and contrast. By adjusting the brightness control on the display you are reading this on you should be able to see the improved blacks on the right. Increase the brightness control until you just see the background black start to rise on the left and see the deeper blacks on the right. The next couple of images are, again, side-by-side on both projectors so that any differences can be observed. As in the color test, it is very interesting to note that the improved black levels seem to attract the eye, and even though the peak highlights are not quite as bright, the eye tends to favor the higher contrast due to the improved blacks. This snapshot from “Jumanji: Welcome to the Jungle” shows that the upgraded projector is able to clearly demonstrate its improved contrast. Look carefully at his chest tattoo and you should be able to see the increased contrast. This next image is from another still shot at the Disney “Paint the Night Parade” just after CEDIA last year. I think we understand why the color differences are so apparent due to the pure LED lighting used in the parade, but not sure exactly why the black levels in these photos seem to show even more than the 4K HDR Blu-ray discs. The differences were so great in some of these still images we even retook the image capture and re-setup several times to make sure we were not missing something. The camera used to capture the original images at the parade was a Sony Alpha A6300 in wide color gamut mode. The end result of the Upgraded UHZ651, for improved black levels and contrast, was very pleasing to us and the 11 months of trial and error seems to be paying off. Those who have experienced it and those who have seen a live side-by-side demo have likewise been impressed. The improved contrast, like the improved color, comes at a price of reduced measured brightness. However, like the color, the added contrast seems to fool the eye and, to the eye at least, the slight decrease in brightness does not seem to be visible on most scenes. Read Part II of this comparison! It covers imaging scaling, color mapping, HDR, and contrast! This entry was posted in AV Solutions, Home Theater and tagged 4k, 4k hdr, 4K Laser UHZ65, black levels, BT 2020, BT2020, color gamut, Contrast, Enhanced UHZ65, HDR, Optoma 4k UHZ65, rec 709, REC709, THEO-Z65, uhz65, Upgraded UHZ65, wide color gamut.